This new paper by F. Alvaredo, L. Assouad and T. Piketty, “Measuring Inequality in the Middle East, 1990-2016: The World’s Most Unequal Region?”, WID.world Working Paper 2017/15, combines national accounts, survey and fiscal data in order to provide consistent series on income inequality in the Middle East from 1990 to 2016. 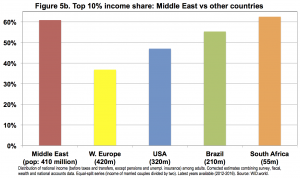 HIGHLIGHTS: According to the benchmark series, the Middle East appears to be the most unequal region in the world, with a top decile income share as large as 61% of national income, as compared to 36% in Western Europe, 47% in the USA and 55% in Brazil. This is due both to enormous inequality between countries (particularly between oil-rich and population-rich countries) and to large inequality within countries (which we probably under-estimate, given the limited access to proper fiscal data). The associated Appendix is available here and the data files can be downloaded here.